The process for the silent auction is pretty damn depressing, so all of us in Rote Kapelle were really hoping we'd get picked up in the random draw today for Alliance Tournament XI. Nope. Congratulations to those that did get in this way, though! Aww, poor baby... who cares. Login servers seem to be having problems today. Might be affecting thing for you. I'd prefer there to be two auctions, with the random drawn in between. (To have less random slots go to rich alliances who can pay for their slots anyway). PL and Verge of Collapse didn't make it? No, CCP elected not to give anyone a bye this year. Everyone who wants in has to either be drawn or pay for a slot via the silent auction. Over today, the remaining alliance executors that wish to participate in the tournament have to send contracts of PLEXes to the CCP employee coordinating the remaining 32 tournament slots. 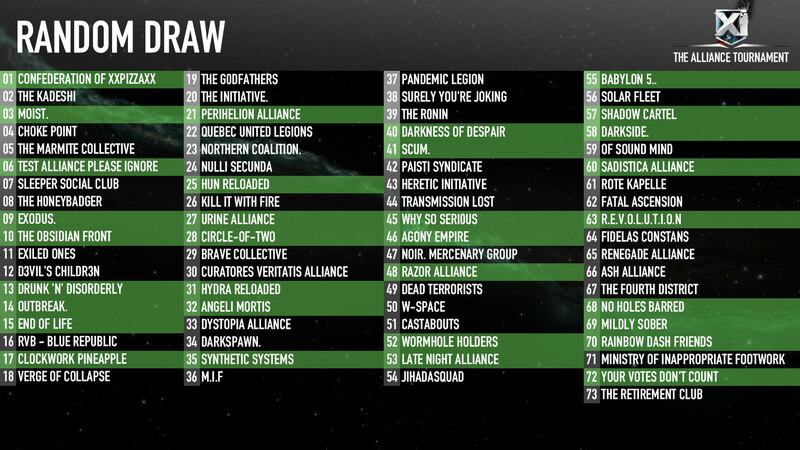 The 32 alliances that bid the most PLEXes get the slots. Why can't all the teams be in? For the brackets to work, that means 64 teams, no more. With more teams, some teams would need a larger number of matches (thus spending more ISK and more pilot time) to get to the same final. I hope Rote gets in. See you in PE1, Ripard.